While facing the same problem I Googled about it and found I’m not the only one. Well, let me explain the problem for you. 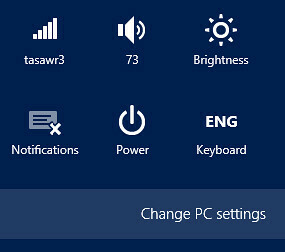 When I open the Windows 8 Charms Bar and click on Settings gear icon and then click on the Change PC Settings link on the bottom of the page, nothing happens!! I went to this Microsoft Answers page and found an experienced Microsoft MVP gave a funny suggestion, which is to restore your Windows to previous condition. Dude, seriously! We just cannot roll our system back to some old stage. So I used my head and tried to remember what I did wrong and how I can correct this. For me, it’s not possible to roll back to anywhere. Maybe my MVP friend have plenty of time, but unfortunately I don’t. Then I remember that while playing with my start menu items, I have deleted the PC settings shortcut. This also happens if someone installs a 3rd party start menu and customizes that. So I went to C:\ProgramData\Microsoft\Windows\Start Menu\Programs on a friend’s PC. Took the PC settings shortcut and put it in the same location on my PC. Extract it and you’ll get the PC settings shortcut in there. And you are good to go. Let me know how it went with you. It incredibly works! You rock! Thank you! thanks buddy it really works. I tried all methods which I got on Windows form but my notebook was still not okay.. I didn’t want to restore my Windows 8. The “Change PC Settings” still was not working. Even the “Change account picture” was not working either. I am truly happy that I found your article. It did work as I was want. But one thing I want to mention that I could not download that zip file of shortcut icons. However I used another notebook of my friend to fetch those icons. If someone need those Icons so he can get by clicking on the following link: http://goo.gl/Vj1SJ. You are a star. Clicking the icon just takes you to the Control Panel – but moving it – excellent job! worked perfectly – exactly what I needed Stardock 8 killed that file and restore was awful option!